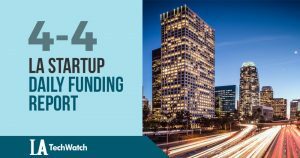 The latest venture capital seed and angel deals for LA startups for 4/8/19 featuring funding details for Wone, weThink, and much more. Insights from the top LA Agtech startups, founders, and entrepreneurs driving innovation in the LA Tech ecosystem. The latest venture capital seed and angel deals for LA startups for 3/28/19 featuring funding details for Wormhole Labs. The latest venture capital seed and angel deals for LA startups for 3/26/19 featuring funding details for SPIDR Tech.